Explain JR House in the #1 spot. There were so many posters here in those days acting like House was the answer to all the problems he was just a few at bats and a chance away from being a stand out hitter. Folks were nuts over him. The glory days. Go back in time to the mid-2000s. The Orioles were bad, relatively expensive, and every off-season signed mediocre $5M placeholders for no reason. And they had a derelict minor league system. They seemed to treat AAA and the back half of the roster as random guys who could fill in if and only if the regular breaks something, not positive assets to be leveraged. So when they signed House and Jon Knott they appeared to be exactly the undervalued assets I'd long been advocating. House had hit .400 with a 1.000+ OPS in a short stint in AAA after coming back from a 2005 injury. And had a long history of hitting in the minors. Knott was similar, with an established track record of .900+ OPSes in the minors. I was like "finally, they're going to get Kevin Millar's production at pennies on the dollar and take the savings and do something productive." But this was the Orioles, so House and Knott got like 50 at bats total, they kept signing $5M 33-year-old placeholders, and nothing changed until 2012. I remember those days, I was here. I remember getting semi-caught up in those two guys, they were the ST Babe Ruth and Lou Gehrigs of the day. While I remember them for doing nothing here, I took comfort in the fact knowing that they didn't pan out anywhere else, ala Jose Bautista. Fasano is my favorite O’s backup catcher ever even though he didn’t grow the cool Fu Manchu here. He had his best hitting year here. But another old name, Paul Bako. They should bring back Caleb to replace Joe Angel. He's a natural in the booth. If you gave Caleb a mic, he would be a better color guy than Bordick today. Great story. I love those cup of coffee player stories. It would not surprise me in the least if Caleb doesn't one day go into broadcasting. I'd like to see him give coaching/managing a shot first though. No love for Bob Melvin or Terry Kennedy? I was never a huge Bob Melvin fan for some reason, probably because I remember him being a terrible hitter. My mental image of Melvin is of him taking a big rip at a pitch, topping an 8-hopper to third, and the throw beating him by six steps. 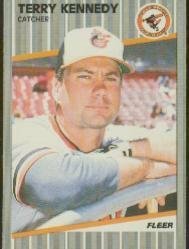 Terry Kennedy was symptomatic of everything wrong with the 1984-88 Orioles: random grade C free agent who'd been a minor star several years prior, signed by the O's because they couldn't or wouldn't sign better players and they had nothing from the farm to fill the role. Here Terry, take our $2M, try to hold on another year so we can win 78 games. Wow... I'd forgotten just how bad Kennedy was. 1987 was a big hitter's year, and he had a .684 OPS and played almost full-time. But he was the Orioles' token All Star. In '88 he was much worse. "I'm Terry Kennedy and I'm slightly hungover. But drinking every night is the only way I can cope with being a part of the '88 Orioles." He might've been slow, but he wasn't Mark Parent slow. I've never seen a slower major league baseball player. In all my years on the OH, I can't think of many guys who've gotten the visceral hatred almost from day one that Keith Osik received. At the very least it did lead to some great mock-up's of Osik, including Keith No-Stick, and Keith O-So-Sick to my Stomach.